N a r r a t i v e G u n d a m B - P a c k s E q u i p m e n t C o m p l e t e ― －－－　A coupling item of "HG Narrative Gundam A-Packs" (sold separately) is released ! Reproduce the impressive scenes from the story !! －－－ *The Mobile Suit itself is not included in this product. 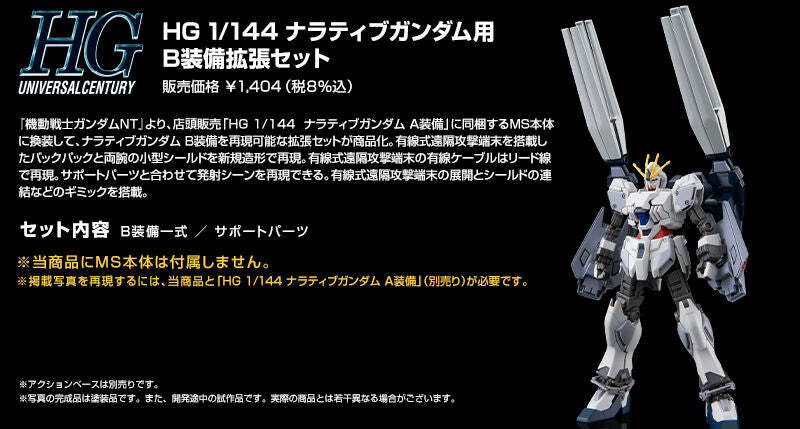 From [MOBILE SUIT GUNDAM NT(Narrative)], the expansion unit that can reproduce Narrative Gundam B-Packs by equipping it to the mobile suit included in "HG 1/144 Narrative Gundam A-Packs" (sold in retail stores) is released. 〈 Set Content 〉 ●　B-Packs set ●　support parts ◆◆　B-Packs reproduced by new moldings Backpack equipped with wired type long range offensive device, along with small shields on both of its arms are reproduced by new moldings. ◆◆　Wired type long range offensive device’s launching scene reproduced Wired type long range offensive device can be removed from the backpack. Cables are reproduced with wires. The launching scene from the story can be reproduced by combining the included support parts and Action Base 4 and 5. ◆◆　Each gimmicks reproduced Wired type long range offensive device’s launch gimmick is reproduced by parts replacement. The small shields on both arms can reproduce the connecting gimmick (not seen in the story) that exists in the design by Katoki Hajime. 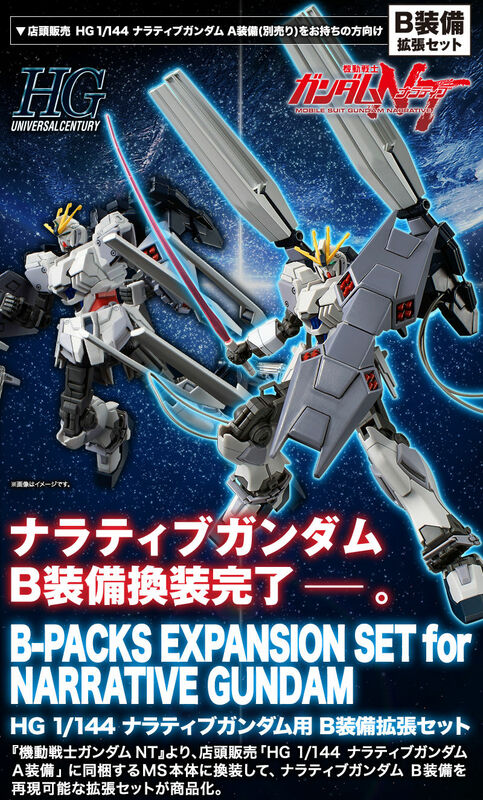 －－－－－－－－－－－－－－－－－－－－－－－－－－－－－－－－－－－－－－－－－ This product is a set of weapons and parts for reproducing Narrative Gundam B-Packs by combining it with "HG Narrative Gundam A-Packs" (sold separately) available in stores. *Mobile Suit is not included with the product. 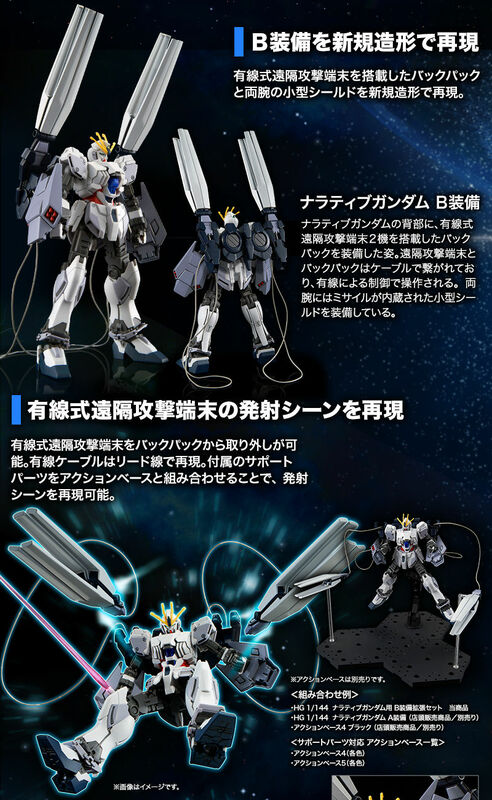 *This product and "HG Narrative Gundam A-Packs" (sold separately) are required to reproduce the images seen in this page. 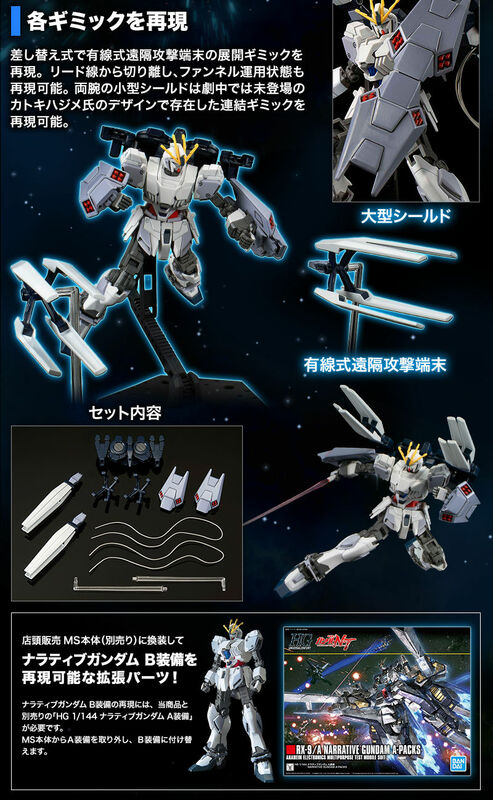 *There are no plans for "HG Narrative Gundam A-Packs"(sold separately) to be sold at Premium Bandai. *Action base is sold separately. －－－－－－－－－－－－－－－－－－－－－－－－－－－－－－－－－－－－－－－－－ 1/144 scale assembly plastic model ･No adhesives required for assembly －－－－－－－－－－－－－－－－－－－－－－－－－－－－－－－－－－－－－－－－－ *The product in the picture is painted and is a prototype in development. Actual products may differ from the images.